without allowing them to control us. We step back and look at things objectively. We let go and accept what we cannot change. knowing that their spiritual work is not ours to do. We choose how we will act rather than just reacting. We step away from harmful cravings. and patience in response to unexpected anger. We can listen without losing ourselves. honestly make amends and start afresh. 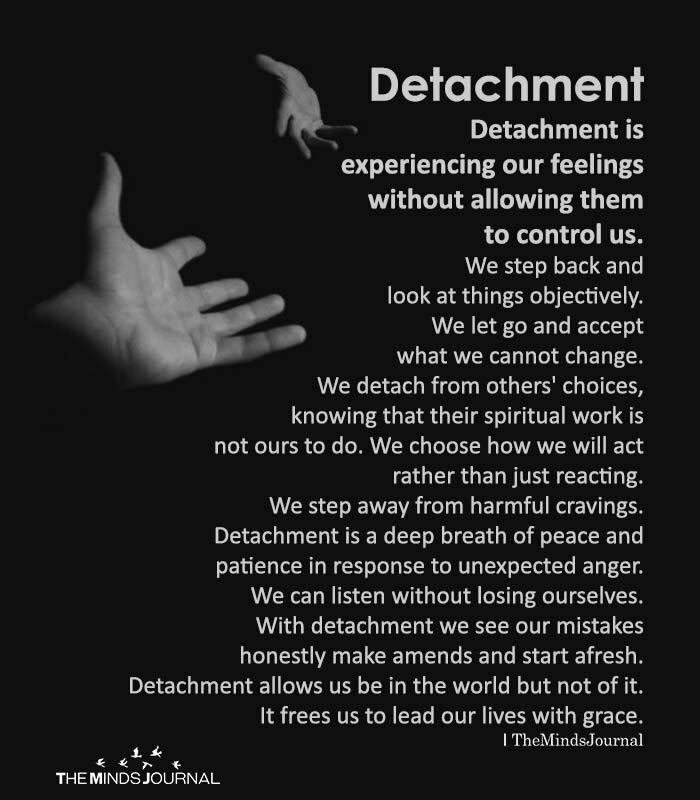 Detachment allows us to be in the world but not of it. It frees us to lead our lives with grace. You are still young .This kind of thinking and being is more so realised later in life .The young are still attached to ego ,vanity and obsessions .The young are almost incapable of detaching from as they must remain attached long enough to learn their lessons . The ability to detach can also move one away from friends and family so that you can’t be emotionally hurt.